Fr Anthony attended Grammar School in Bristol before reading for a BSc in Chemistry at Leeds University. He remained at Leeds for a post-graduate year in order to study chemical engineering and fuel science, and was subsequently appointed as a process engineer within the Gas Industry. Town gas production stopped after the discovery of natural gas in the North Sea, and after a year or so in customer service work Fr Anthony returned to University in order to qualify as a teacher. He taught chemistry and mathematics at a College of Further Education and did some occasional teaching in a local prison. A full time appointment as an Education Officer in a Young Offender Institution was followed by a secondment to Birmingham University to read for a Master’s degree in the Psychology of Education. Work with boys whose learning difficulties were associated with emotional and behavioural problems followed, and it was whilst he was Deputy Head at a special boarding school that Fr Anthony asked that his vocation to ordained ministry be tested. He gained a Theology degree from Exeter University and was subsequently ordained as an Anglican deacon and then priest. He served his Anglican title at St Gregory’s church in Seaton as assistant curate to Revd Tim Schofield before being appointed as an assistant chaplain at Wonford Hospital. The last six years of his Anglican Ministry were spent as a Team Vicar in the Rectorial Benefice of Aberavon (Port Talbot), before returning to live in Seaton. The decision to leave the Church of England was made shortly afterwards, and both Fr Anthony and Susan, his wife, were received into the Church of Rome at the same time. Three years of part time formation at Allen Hall Seminary followed, during which time Msgr Mark O’Toole was Rector. Fr Anthony was ordained deacon by Bishop Mark on 2 March 2014 and priest on 21 June in the same year. He was incardinated into the Personal Ordinariate of Our Lady of Walsingham and shortly afterwards began to work as a part time assistant Catholic Chaplain at HMP Exeter. 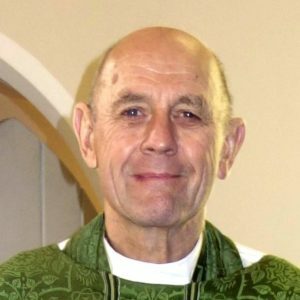 In August of 2016 he was asked if he would help as a permanent supply priest at Axminster, Seaton and Lyme Regis following the sad death of Fr Michael Koppel, and in March of this year, with the agreement of his Ordinary, Msgr Keith Newton, Bishop Mark appointed Fr Anthony as parish priest. Fr Anthony has two grown up sons and two small grandsons who are the delight of his life. He believes there should be a seamless join between liturgical and pastoral work and to that end he puts great emphasis on sharing in the joys and the sorrows of those amongst whom he has been placed.